Formerly the Place d'Armes around which New Orleans was built, Jackson Square, a National Historical Landmark, is now the most prominent location in the “Vieux Carre” or Old Quarter. On December 18, 1814, Jackson reviewed his troops on this site. 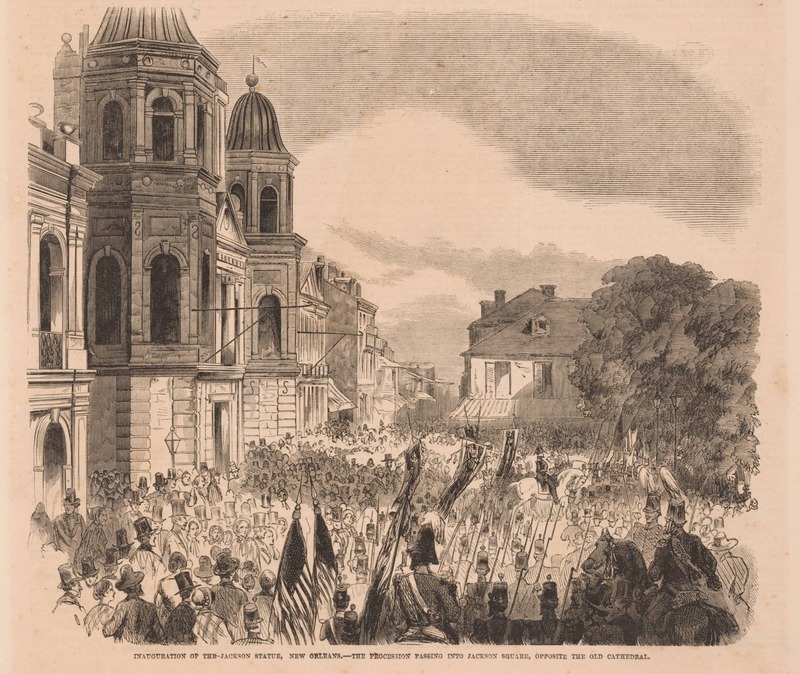 He spoke in English to the large crowd; his aide-de-camp, attorney Edward Livingston, translated Jackson's remarks for the primarily French-speaking residents of the city. 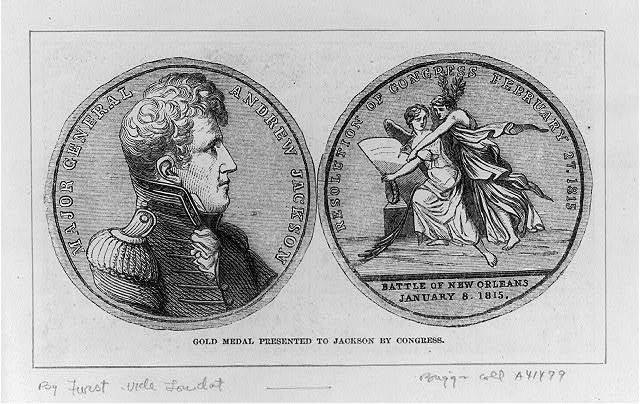 On January 13, 1840, Andrew Jackson returned to lay the cornerstone for a “Battle Monument” in the Place d’Armes, commemorating the American victory over the British 25 years earlier at the Battle of New Orleans. 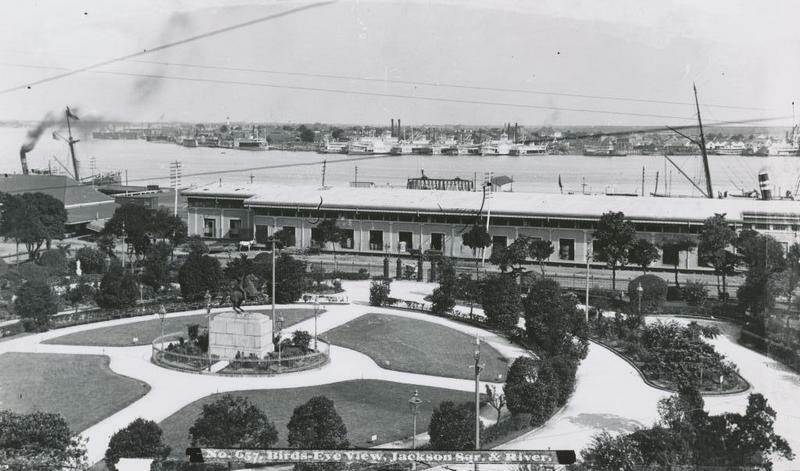 Jackson died in 1845, and in 1851 the Place d’Armes was renamed Jackson Square in his honor. 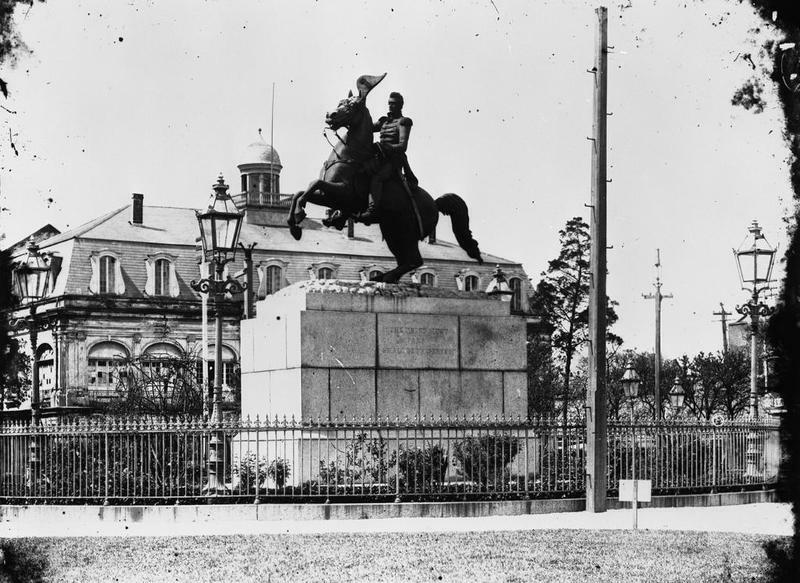 Five years later, 60,000 persons attended the unveiling of the sculpture of Jackson atop his horse on February 9, 1856. 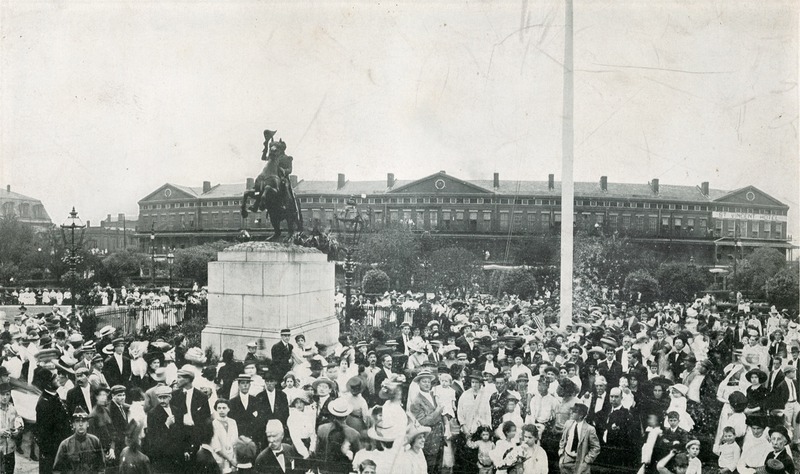 The focal point of the square, the Jackson equestrian statue was sculpted by Clark Mills, at a cost of $30,000. Three other identical statues are located in Washington, D.C., Nashville, Tennessee, and Jacksonville, Florida. Many praised the artist for the manner in which he succeeded in balancing such a mass of metal — 20,000 pounds — without any support or prop beneath. In this position, the statue has withstood the storms and hurricanes that have buffeted the city. Clark Mills, appearing at the dedication, described his statue as depicting General Jackson on horseback as he reviewed his troops on the morning of January 8, 1815 before the battle. The lines have presented arms in salutation to their commander, and Jackson has lifted his plumed hat — the customary manner of returning a salute in those days. His high-spirited horse, aware of the next movement, is making strenuous attempts to dash down the line, but is restrained by the superb horsemanship of its rider. 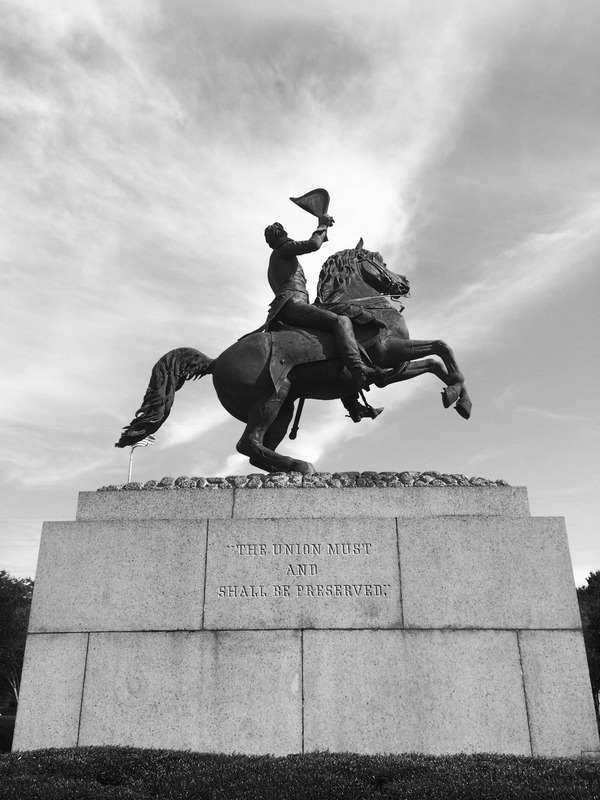 The statue represented Jackson, who “with a handful of men, proved himself the saviour” of New Orleans. The inscription on the granite base of the monument was cut by General Benjamin Butler's orders during the federal occupation of New Orleans during the Civil War. In 1830, at a celebration for Thomas Jefferson’s birthday, President Andrew Jackson had made the following toast: “Our Federal Union: It must be preserved!” In 1862, General Butler changed Jackson’s famous statement, whether intentionally or unintentionally, to read: "The Union must and shall be preserved." Strolling through Jackson Square away from the Mississippi River, one sees the red brick Pontalba Apartment Buildings bordering the left and right of the Square. The buildings were named after Michaela Leonardo Antonie Almonester, Baroness de Pontalba, daughter of Don Andres Almonester y Roxas. 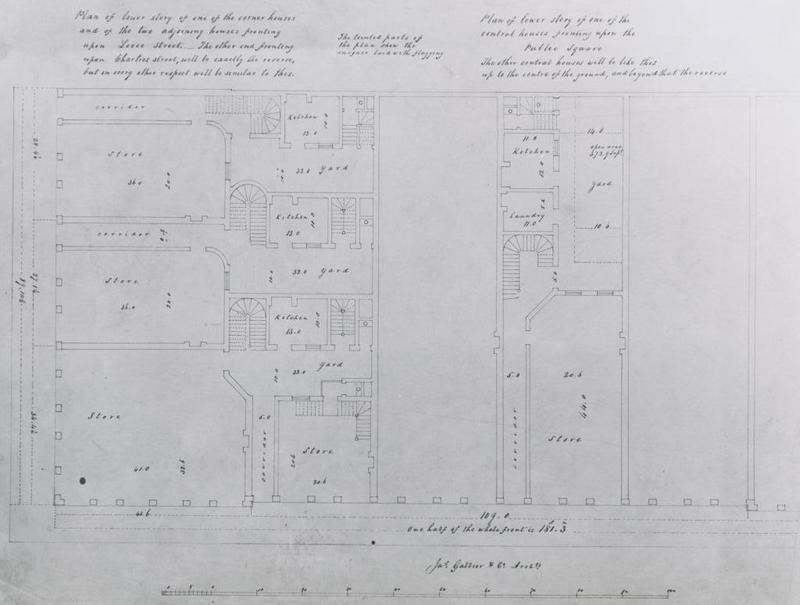 In 1845, the Baroness Pontalba began construction of apartment buildings facing Jackson Square and beautification of the gardens to resemble those found in Paris. 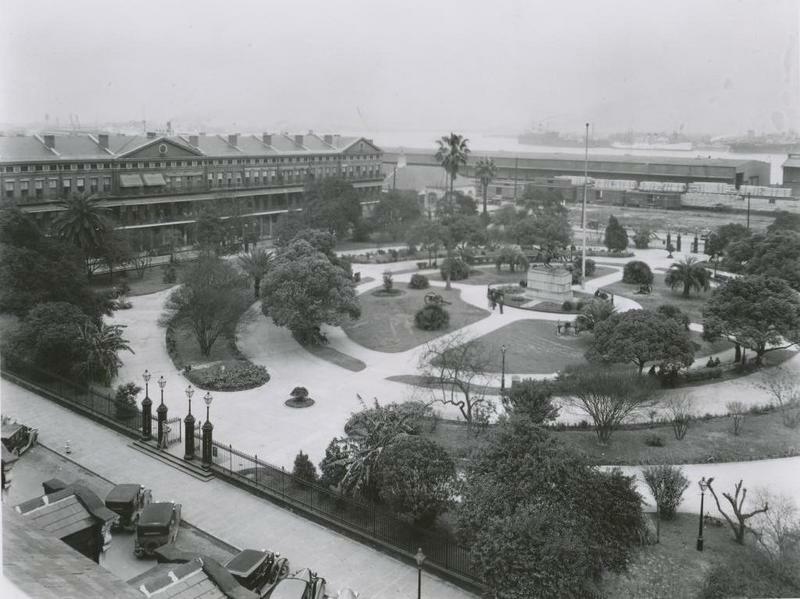 Jackson Square was to be one of the most beautiful squares in the country. 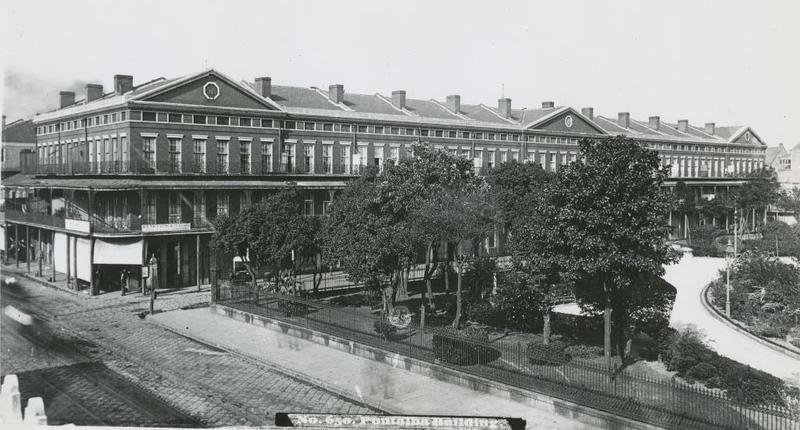 Five years later, in late 1850, the Baroness completed the Pontalba Buildings. 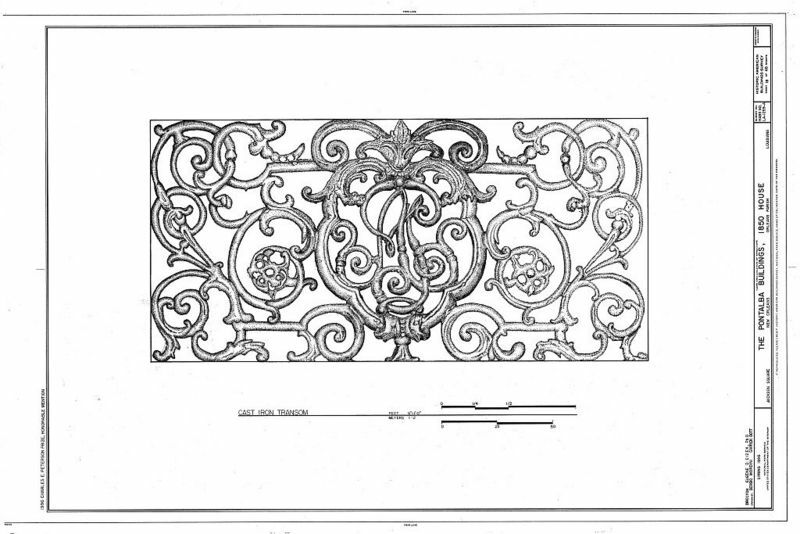 If one looks closely, the entwined initials “AP” for Almonester and Pontalba appear on the cast iron balconies. 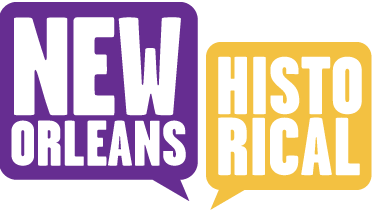 The buildings on the St. Ann Street side of Jackson Square, or the Lower Pontalba Apartments, are owned by the state of Louisiana. The Upper Pontalba Apartments on St. Peter Street are owned by the City of New Orleans. Each building houses 16 four-story townhouses that have commercial tenants on the first floor and apartments on the upper floors. The Lower Pontalba Apartments remain one of the more exclusive addresses in the City of New Orleans. 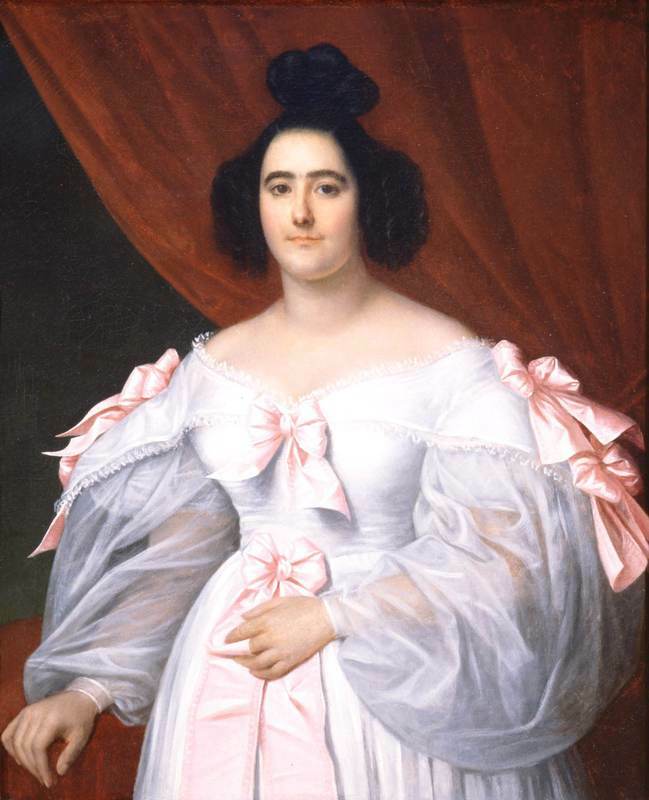 Baroness de Pontalba (née Micäela Leon Arda Antonia Almonester), Unknown artist, ca. 1835, Oil on canvas: Courtesy of the Collections of the Louisiana State Museum, Gift of Mrs. Emma Hoft Ronstrom. This portrait is currently on exhibit in the Cabildo. 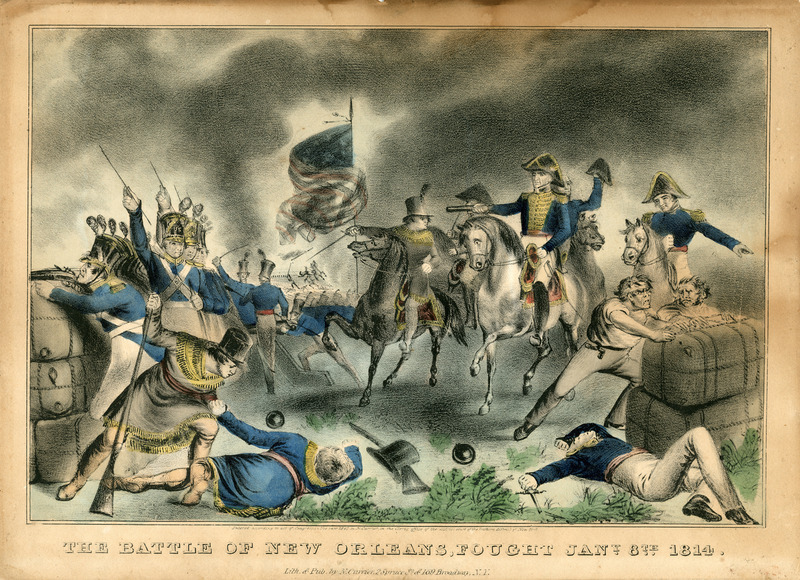 Mary Ann Wegmann, Louisiana State Museum, and University of New Orleans History Department, “Battle of New Orleans: Jackson Square ,” New Orleans Historical, accessed April 24, 2019, https://neworleanshistorical.org/items/show/623.